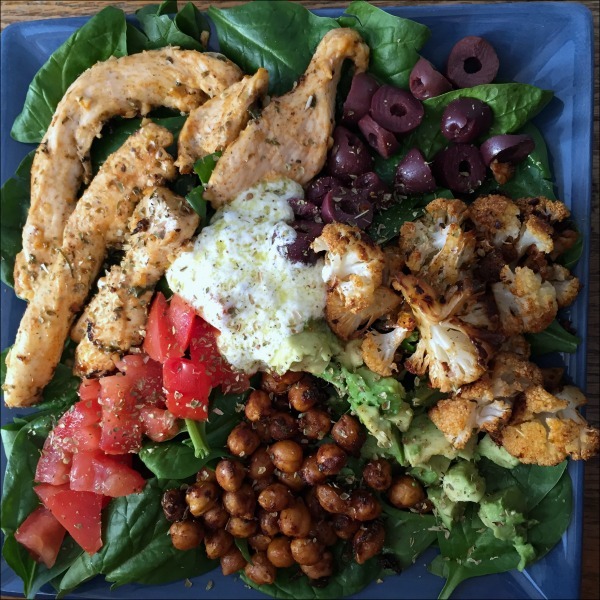 Here’s a colorful and protein-packed salad recipe for you, and the roasted chicken, cauliflower, and chickpeas that star in this Sheet Pan Mediterranean Spinach Salad with Lemon Yogurt Dressing keep it feeling warm and hearty — even on a cold winter’s day. Spray a rimmed baking sheet with cooking spray and preheat oven to 425 degrees. Combine marinade ingredients in a large bowl. Spoon half of the marinade into a separate bowl, add chicken, and toss to coat, then set the chicken aside to continue marinating. Add the cauliflower florets to the bowl containing the rest of the marinade, and toss to coat. Spread cauliflower out in a single layer on the prepared sheet pan and roast at 425 degrees for 10 minutes. Meanwhile, drain and rinse the chickpeas and pat dry with paper towels, discarding any skins that slough off. Toss chickpeas with olive oil and spices in the same bowl you used for the cauliflower. After 10 minutes, remove the pan from the oven and stir the cauliflower, moving it to one half of the baking sheet. 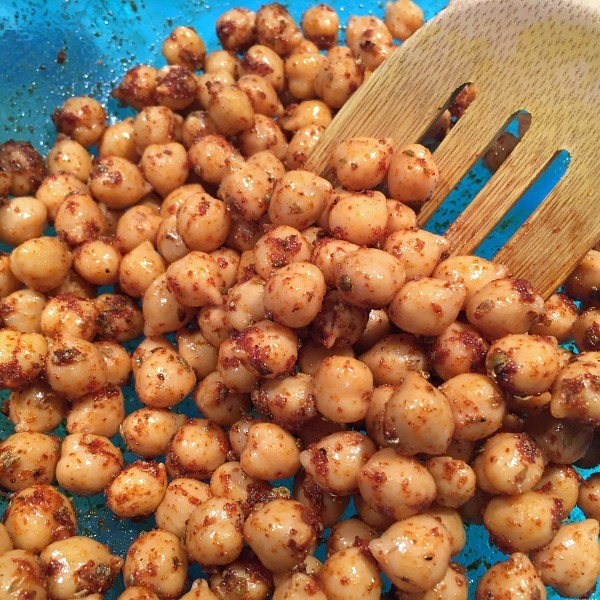 Add the chickpeas in a single layer to the same pan and continue roasting for another 15 minutes. After 15 minutes, remove the pan from the oven and stir both the chickpeas and the cauliflower, moving them aside to make room for the chicken but keeping them in a single layer. Add marinated chicken to the baking sheet and continue roasting at 425 degrees for another 10 minutes, or until chicken is cooked through. While chicken is cooking, mix together your Greek yogurt dressing (I just used my little food chopper), then taste the dressing and add a little more lemon juice, oregano, or other seasonings as desired. Also, chop the tomatoes and avocado (and/or cucumber) for the salad. When the chicken, cauliflower, and chickpeas are done, remove the sheet pan from the oven and let it rest for 5-10 minutes. Arrange the roasted chicken and vegetables on top of the fresh spinach, along with the tomatoes, olives, and avocado or cucumber, then sprinkle the entire salad with dried oregano. Serve your finished Mediterranean spinach salad with lemon yogurt dressing (see Note). Note: The dressing will start to separate fairly quickly, so just give it a good stir right before serving. Note that you do want it on the tart side to play off the seasonings on the roasted chicken, cauliflower, and chickpeas. You can either plate your four salad servings separately or make one big plate; I made mine separate so that low carb MashupDad could easily leave out the chickpeas. Before making this salad I seriously considered driving to the store for… one cucumber. But you know what? It’s cold outside, and I really have better things to do with my time — so, that cucumber simply became avocado in the recipe idea floating around in my head. You can often improvise if you don’t have (or don’t enjoy) every ingredient in a recipe, and the avocado was actually darn tasty (so the next time I think I’ll use both!). 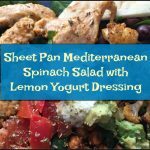 This mouthwatering sheet pan Mediterranean spinach salad with lemon yogurt dressing is naturally gluten free, and chock full of lemon, garlic, and oregano flavor. Everything in the salad but the chickpeas is low carb (if you’d like to modify it for a low carb diet); if you’re not low carb, you could easily throw everything into a wrap or enjoy your salad with pita bread or naan. 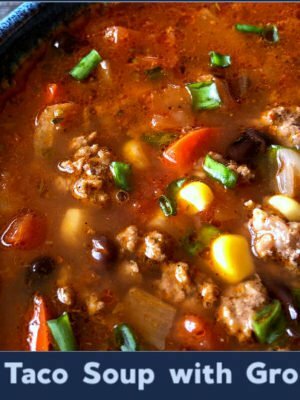 Make it work for your tastes and your family’s dietary needs. 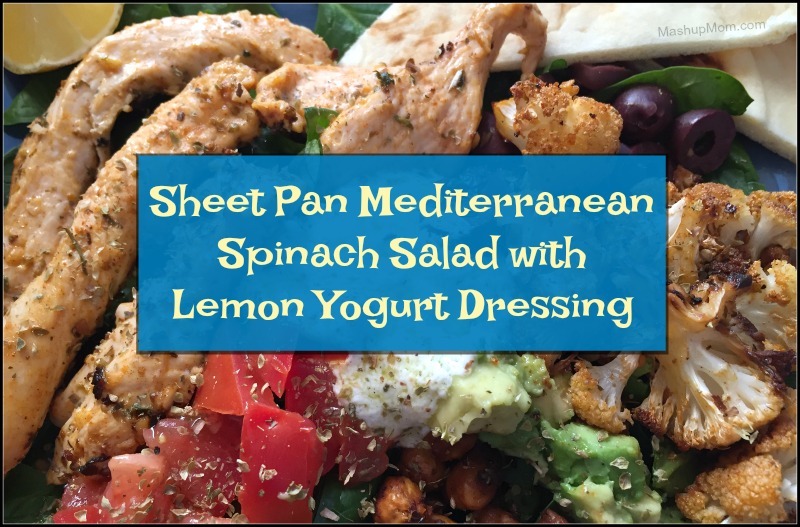 This mouthwatering sheet pan Mediterranean spinach salad with lemon yogurt dressing is naturally gluten free, and chock full of lemon, garlic, and oregano flavor. 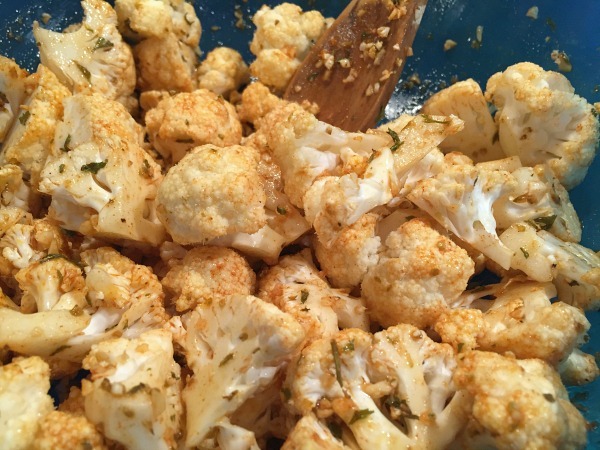 Spread cauliflower out in a single layer on the prepared sheet pan and roast at 425 degrees for 10 minutes. Meanwhile, drain and rinse the chickpeas and pat dry with paper towels, discarding any skins that slough off. Toss chickpeas with olive oil and spices in the same bowl you used for the cauliflower. After 15 minutes, remove the pan from the oven and stir both the chickpeas and the cauliflower, moving them aside to make room for the chicken but keeping them in a single layer. Add marinated chicken to the baking sheet and continue roasting at 425 degrees for another 10 minutes, or until chicken is cooked through. 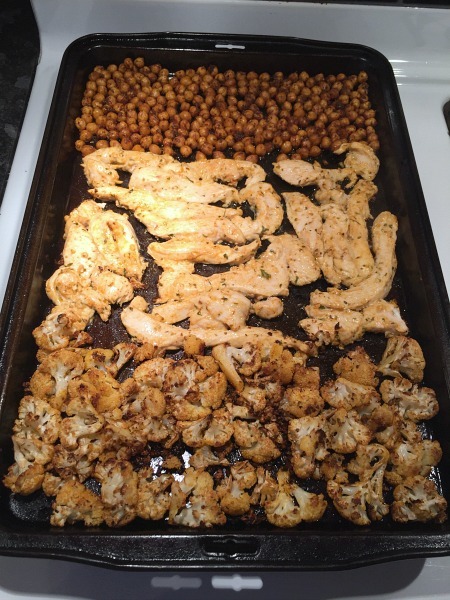 When the chicken, cauliflower, and chickpeas are done, remove the sheet pan from the oven and let it rest for 5-10 minutes. Arrange the roasted chicken and vegetables on top of the fresh spinach, along with the tomatoes, olives, and avocado or cucumber, then sprinkle the entire salad with dried oregano. The dressing will start to separate fairly quickly, so just give it a good stir right before serving. Note that you do want it on the tart side to play off the seasonings on the roasted chicken, cauliflower, and chickpeas. 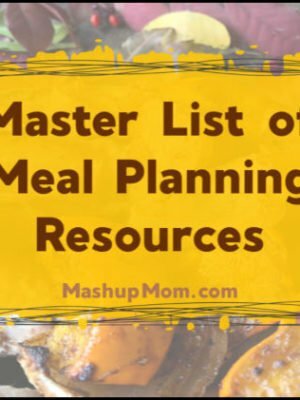 You can either plate your four salad servings separately or make one big plate; I made mine separate so that low carb MashupDad could easily leave out the chickpeas. Thank you for this! Weight Watchers just released a new plan that makes the majority of the ingredients in this delicious looking meal to be zero points! The only real thing with points is the olive oil. Do you feel it is all necessary? Could it be reduced or left out of any step? Right now I am calculating a serving to be around 6 SP (because of the oil), would love to reduce it even more! Thanks for a great recipe! Thanks! 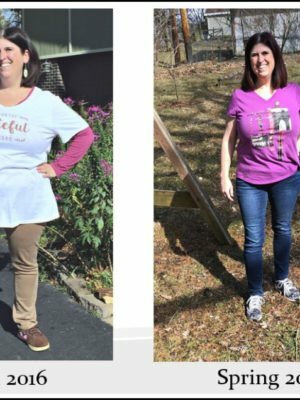 🙂 You can substitute your own lighter dressing for the olive oil and Greek yogurt based one — or simply halve the dressing and use less per serving, since it does actually make quite a bit. You can also try reducing the olive oil in the chicken/cauliflower marinade to 2 Tbsp — I wouldn’t go any less than that, though. Made this for pre-Christmas family dinner, and everyone loved it! 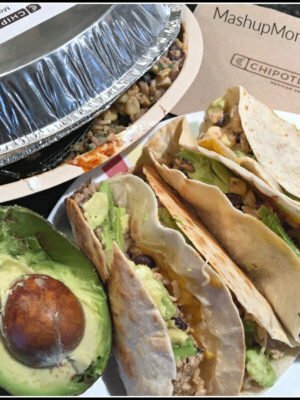 So much flavor and very filling. 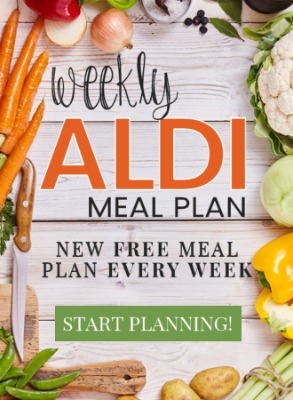 I have been asked to make this part of our monthly meal plan! So glad that you enjoyed it! I’m trying to get more hearty dinner salads in during the winter months, since it’s so much easier to think of them as a summer-only food. I want to eat this everyday forever! It’s just outstanding. I’m gonna recommend it Ryu my vegetarian friends as well by doubling the chick peas and cauliflower. You mentioned it was a little more work than your usual recipes but it was absolutely worth it! You’re my hero.